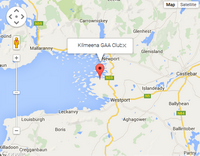 Kilmeena GAA Club - GAA Updates! You are here: Home GAA Updates! Kilmeena GAA club & Kilmeena Ladies Football Club will hold a joint registration evening for all age groups on Monday, February 17 at 8:30pm in Fahy Community Centre. Another registration evening will be held on Friday, February 21 at 8:30pm in Kilmeena Club house. As training for some ages will commence in the coming weeks it is important that you come along on the night to register. Membership packages for all families will be available. As part of Kilmeena GAA Club’s commeration of its 125th Anniversary, a number of events and activities is planned. To kick-start the year a Function will be held on Saturday, March 8 in the Clew Bay Hotel at 8:30 pm. The launch of the ‘125’ Celebrations will take place as well as the Annual Presentation of Awards, including the Player of the Year, Most Improved Player, Best Young Player, Club Person of the Year and Community Person awards. As this is the first event of the year it is hoped for a good turnout. Please put a note in your diary and be part of the opening festivities! This will be followed up with a Social on Sunday, May 4 in the Club House for the older generation. Former officers, members, supporters and anyone who was involved with the Club in any capacity will be invited along to this informal function. This is in recognition of the efforts of the seniors amongst us, women and men, who ensured that the Club prospered down through the years. A hard working committee is fully engaged in various activities in order to make the occasion a memorable one for the Club. A record of notable events and achievement over the last 25 years is being compiled. A photographic display and slide show is also well advanced, with some surprises thrown in. Thanks to all those who have sent in photographs and keep the old photos coming in. The three National Schools in the Parish – Fahy, Myna and Carrowholly are taking part in a competition to design a Logo and Caption on the theme “Kilmeena GAA Club – 125 years old”. The winning entry will be used throughout the year on the Club’s notepaper and on commemorative presentations and plaques. A Bord na nÓg and Kilmeena Ladies meeting will take place at the clubhouse on Thursday, January 30 at 8pm. This will be followed by the Kilmeena Club meeting at 9pm. For the Bord na nÓg/Ladies meeting the management teams for all the underage teams, boys and girls will be finalised. It is very important to realise at this point that there is an urgent need for female parents to assist with some of the underage teams. Therefore, we are asking parents to make a special effort to attend on the night. If support is not forthcoming at this meeting, then a decision on whether or not to enter a specific team will be made. With regard to the club meeting a discussion will be held, to decide on activities to celebrate the clubs 125 years in existence this year. All members are requested to attend both meetings. Club Registration will take place during the Month of February, the dates will be announced later. This year we will be holding a registration night in Fahy, with a further two nights in the clubhouse. It is important to note that every child must be registered to comply with insurance regulations. It is proposed to recommence the club lotto on Thursday night March, 6. In advance of this date lotto sellers will be calling to supporters who have in past years purchased Annual Lotto tickets and tickets for the County Board draws. Once again your support is much appreciated. futures can start being put in place. 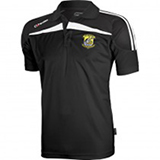 The year 2014 is a historic occasion in the life of Kilmeena GAA Club. This year we proudly celebrate 125 years of our existence. Kilmeena were affiliated to the County Board in 1889 and played their first game of football on March, 10 of the same year against Westport. In the intervening years there have been many highs and lows, and the Club has been ever present in the life of the Parish. It is the Club’s intention to honour all those people, men and women, who gave of their time freely to ensure that the Club prospered. A committee has been formed who are planning a series of events which will commemorate this important milestone in the history of the Club. There will be opportunities for young and old to become involved, with events spread throughout the year. A launch of the celebrations will take place in early March. Further details will be provided later. There is much to look forward to during the coming year. An exhibition of photographs is now being organised which will give a visual representation of the Club during the past 125 years, something that always arouses a special interest and will take us down bóthairínnasmaointe! An appeal is made to all those who have photographs, particularly older photos, to make them available to any Club Officer or Martin McIntyre for this display. Great care will be taken to return photos as soon as they are scanned. Photos that are included in the Centenary History of the Club would be particularly welcome. Your help here would be greatly appreciated. 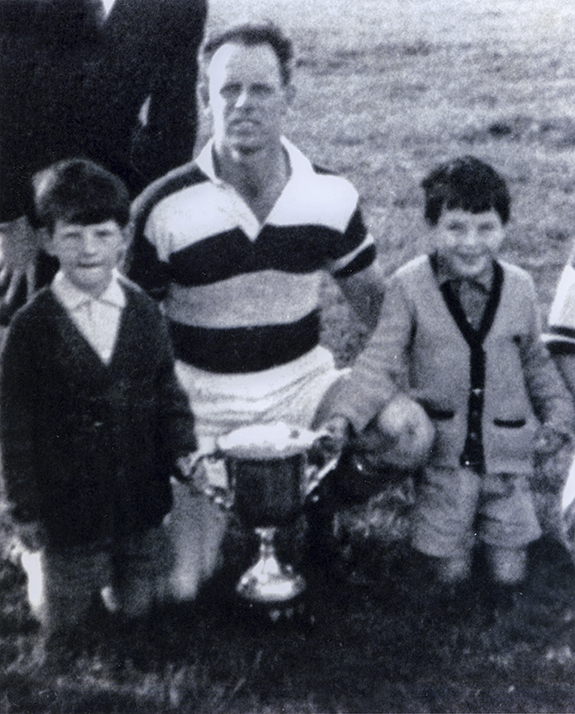 Many thanks to Tommy Cox, pictured with the Cusack Cup, for providing a little bit of nostalgia with this photo taken after Kilmeena defeated Westport in the West Mayo Junior Final of 1968. It's up to the reader to identify the two young supporters holding the cup!